WASHINGTON — The U.S. surface Navy is moving rapidly toward buying a new large surface ship that will replace the aging cruisers, a ship that Navy leaders and experts say will need to be spacious to accommodate future upgrades and weapon systems. The office of the Chief of Naval Operations Director of Surface Warfare, or OPNAV N96, has convened a “large surface combatant requirements evaluation team” to figure out what the Navy’s next large ship will look like and what it will need to do. The goal, according to the N96 head Rear Adm. Ron Boxall, will be to buy the first cruiser replacement in 2023 or 2024. The acquisition process should kick off formally next year once a capabilities development document is completed, but a few main factors are driving the size requirement, Boxall said. The fleet is pushing towards designs that can easily be upgraded without a major overhaul. 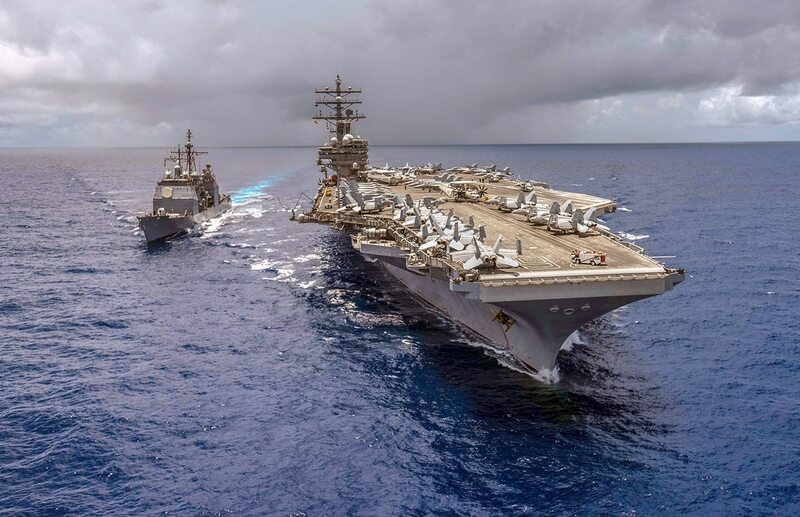 To do that, the Navy thinks its going to need a lot of extra power for more energy-intensive weapons in the future, such as electromagnetic rail guns and laser weapons. “You need something that can host the [size, weight, power and cooling], so it’s probably going to be a little bigger," Boxall said. "Flexibility and adaptability, the ability to upgrade quickly, is going to be a key requirement capability. It’s got to have room to grow. "Power is going to become more important, not just for the Air and Missile Defense Radar, but to add power for directed energy, for rail guns and things like that. How much? We don't know. But we have to be adaptable." The influential head of a House sea power subcommittee is calling on the Navy to enter its oldest 11 cruisers into a service-life extension program rather than retire them at the end of their 35-year hull life. It also wants to be able to get into areas such as the Combat Information Center (the combat system nerve center of the ship) to swap out large consoles and computers without cutting holes in the hull to do so. That means the ship will have to be designed with some kind of removable panels, as well as incorporating extra space to add new consoles and systems if they are needed in the future. Future missiles are also driving the need for a larger ship. Missiles fired by surface combatants are going to need to travel further and faster. That means the vertical launch system launchers will need to get bigger to accommodate a larger missile. The new ship will incorporate Raytheon’s AN/SPY-6 Air and Missile Defense Radar, the same way the new DDG Flight III has incorporated it. The next large surface combatant will have the Flight III requirements as a baseline with room to grow into later, he said. That approach, using an existing set of requirements and adapting them for use in later hulls, has served the Navy well in the past. Boxall pointed to altering the Spruance-class destroyers into the Ticonderoga-class cruisers as an example of what the Navy is trying to accomplish, but added that the new ship would likely borrow elements from both the current DDGs and the Zumwalt-class destroyers now entering the fleet. “We looked at the things we already knew was out there,” he said. "We looked at the DDG-1000 hull – there are things about that we like, there are things we would do differently. There are things about DDG Flight III that we like, and things we don’t like. Integral to any future ship will be the ability to host unmanned vehicles, Boxall said. The Navy is starting down a path of incorporating drones into almost every aspect of their war fighting, from over-the-horizon sensors, to aerial refueling drones such as the MQ-25 awarded to Boeing in late August, to creating datalink networks on the fly if other links are compromised. Designing a surface combatant with that in mind will be key to its success, said Bryan McGrath, a retired destroyer skipper and head of the defense consultancy The FerryBridge Group. “What is crucial to me is that, in addition to its size, sensors, and weapons, this ship must be able to one day accommodate several medium altitude long endurance [unmanned aerial vehicles] capable of dramatically extending both the sensor and weapons range of the ship. Defense News embarked on the ship, facing decommissioning, officers and sailors agreed: USS Mobile Bay has plenty of life left in the tank. ISR assets attached to the aircraft carriers can perform those functions for surface ships, but the Surface Navy has argued in recent years that it can be highly effective in anti-access environments such as the South China Sea if they break free of the carrier and spread out, posing threats for multiple angles and stressing China’s targeting and ISR capabilities. The surface Navy has made progress integrating drones in recent years. The MQ-8 Fire Scout, an unmanned helicopter that can fly off a cruiser, destroyer or littoral combat ship’s flight deck and be used for targeting. In August 2017, the Fire Scout was used to kill a target with a Harpoon launched off the littoral combat ship Coronado. The ranges at which ships will need to fight in the future, however, might mean longer-range drones will be needed to be effective in that kind of scenario.